Lo and behold, I never even knew that I had a German-Russian background until around 2006 or so. To be a bit more precise, I didn’t know what “German-Russian” meant. For those not in the know, as I was, the term refers to colonies of ethnic Germans who were invited to move into parts of “South Russia” in the late 18th and early 19th centuries. The Russians had defeated the Ottoman Turks and displaced them from areas to the north of the Black Sea, the Crimea, the Volga and so on. Since Catherine the Great was of German ancestry, she caused these regions to be homesteaded by folk of German background, well including the Alsace-Lorraine as well. In various waves, settlers came into these regions and largely created new towns and villages that were separated by religious affiliation and the areas of origin of the settlers. The towns were very often named after the towns in Germany where the settlers came from. So, you find place names like Selz, Landau, München, Rosental, Rastadt, and so on. You can find a map of part of the region, the Beresan, here. My mother’s maiden name was Williams, which sounds quite British, doesn’t it? Like so many children, I’d had to do a report on my parents’ ancestry as a school project. My father was very forthcoming about his Scottish birth and background; but my mother, well cagey would be understating the situation, as I recall it. She said her parents were “Prussian” if I remember rightly, though it was fairly clear that some kind of German was spoken at their home; and I was already old enough to have learned that Prussia had been long-ago absorbed into modern Germany. I knew my grandparents well, and loved them dearly. They had a large family, being Catholic; and I was well-provided with aunts, uncles, and cousins. But, my (my wife) Virginia’s family is seriously into genealogy, and my father-in-law, John, started me into using Ancestry.com to check out my grandparents. Well, hadn’t someone already posted that my grandfather, Martin William, had come through Ellis Island with his father, John Scherger, from “South Russia.” Here were a few puzzles. Martin William (yes “William”) was the only child of that surname in a family of Schergers. My birth certificate listed my mother’s maiden name, in her own hand, as Williams. Now, as a child, I had met the Schergers, having thought they were friends of the family. It was turning out that they were a bit more than family friends. By 2005, I was living in Omaha, NE, to my good fortune in this regard. I began to check out the connection between Germans and “South Russia”. Wikipedia has several great articles on the topic. Here is a great lead in article. So that was very interesting. Along the way, I discovered what became my most valuable resource; and if you have this background, I cannot recommend these folks more highly. They are the American Historical Society of Germans from Russia. Since they are located in Lincoln, NE, I could make it from my home in West Omaha to their offices in about an hour. The amazing thing was their library of genealogical and historical information in the basement of the facility. It transpires that there are fairly accurate records of which particular families, from which parts of Germany, arrived in which towns in South Russia, on roughly which dates. Likewise, there are maps of the towns and villages showing which families occupied which homes on the town plans. In my own particular case, it turned out that my grandfather’s original surname had been “Wilhelm” and that his father had been one Michael Wilhelm. This Michael Wilhelm had been conscripted into the Russian army, sent off to fight in the Russian-Japanese War, and had been killed at a battle in China during that conflict. For his part, John Scherger had lost his first wife to illness or childbirth, and he and my great-grandmother had married. My grandfather had kept his father’s name. All of this, down to maps of the town in which my ancestors had lived in South Russia, now Ukraine, showing their home, was in the basement of the AHSGR. How cool was that? I doubt if I hadn’t been so close to Lincoln that I would have gone out of my way to visit the AHSGR purely on speculation that they’d have had that amount of information on my family background. But not only that, my grandmother was an amazing cook. On the main floor of the AHSGR was a bookstore that sold, among other things, cookbooks of German-Russian ethnic dishes with recipes accumulated from folks of this background all over North America. I was in hog heaven, and bought several of these on a number of visits. I could again have küchen for breakfast! Mind you, I had to get up early and make it for myself; but that was a small price to pay, especially when you factored in the look on my little girls’ faces when they got to taste peach küchen for themselves. But I digress from the main topic, genealogy research resources. Of course, two obvious choices are Ancestry.com and Cyndi’s List. I have used both. But here are my “buts” on these. In the case of Ancestry.com, they are crowd sourcing genealogy information. In many specific instances, as in the case of my grandfather, Martin Williams aka William aka Wilhelm, someone posts information that is incomplete or incorrect, it is copied by many others, and it is almost impossible to correct. So, unless you can verify a claim through some document; for example, that someone’s legal name is correct because here’s the birth certificate, or someone’s father is correct because, again, here’s the birth certificate, you should take anything and everything on Ancestry.com with a grain of salt. My father-in-law likes to talk about a photograph of one of his ancestors in this regard; someone posted the wrong image for this woman, it was copied all over, he put up the correct one, and no one uses it, since they already have the original, but mistaken version. In short, it’s nobody’s job at Ancestry.com to go around fixing the mistakes. Likewise, when I was using it, especially for my father’s side of the family, which is Scottish and hence a little off topic, I was continually bombarded with suggested links for people with the surname, Angus, who didn’t match the people on my tree by virtue of dates, locations, and other relatives. I finally gave up on Ancestry.com although my family tree is still up there; unfortunately, since I no longer have an account, I cannot update it to remove mistakes in some locations. So again, beware. On the other hand, where you can find online documents for your family in Ancestry’s records, it’s a great service. Related to Ancestry.com is their Roots Web archive. This site has a great deal of information. For example, I discovered along my search that my grandmother’s side of the family had emigrated into Jamestown ND. Rootsweb was a great source for tracking down information on my great-grandparents’ life there, their home, their marriage, my grandmother’s birth, and so on. As well, since this side of my family had strong ties in both Canada and the US, the Rootsweb site provided a unique look into the Catholic German-Russian colonies in Saskatchewan, specifically, the St. Joseph’s colony. By drilling into this material, I discovered a detailed history of the part of Saskatchewan that my grandparents settled in, Wilkie SK. There is an excellent volume, accessible online, called A Harvest of Memories, in which my family appears. This is just one part of the “Our Roots” site in Canada. However, in the specific area of GR research, the AHSGR does not “outsource” its documents to Ancestry.com or anyone else. So, a great body of incredibly valuable material in this specific domain is not accessible through Ancestry.com or on the web at all. The AHSGR does not loan documents from its library; you just have to go there. If you are a member, you can access some of their material online; but the searches can be cumbersome. For example, to get clear copies of obituary records from German-language North American newspapers, you have to pay on a per record basis. So, you have no good idea if the obit you’re going to get really is your family member until you’ve paid and received it. If you’re at the AHSGR library, you can browse the same set of records in person, and only grab a copy of the ones that make sense. Many of these records are accessible, if you want to try, through their Saving Our Ancestral Records (SOAR) site. Back to Cyndi’s List…, the list has a specific category for German-Russians here. Unfortunately, as is frequently the case with Cyndi’s List, there are several broken or inappropriate links. For example, the links to the subcategory for North Dakota just go generally to anything about North Dakota; so, below the German-Russian category, you can find material about Native American tribes in North Dakota. In short, Cyndi’s List is large, but not very well-maintained, in my humble opinion. There is a ton of information accessible through Cyndi’s List, but again, caveat emptor. And since the price is free, it’s a good starting place. Of course, if a visit of several days to Lincoln NE isn’t in the cards for you, you can request research assistance from the AHSGR staff, for a fee. You will get excellent results though. If you value your own personal time, this avenue is well worth the cost, again, in my own personal opinion. There are other similar resources to draw upon, like the AHSGR. For example, the North Dakota State University (NDSU) hosts a Germans from Russia Heritage Collection (GRHC). This material is indexed online, but requires a visit to access. As a very valuable bit of background, here is an address by Michael Miller, Bibliographer for the GRHC from back in 1990 in Sacramento, CA. What is of unique value in this address is the set of references to genealogical resources of unique value to German-Russians of specific backgrounds; for example, Bessarabians, Hutterites, Mennonites, and so on. As well, the address includes references to another one of the important organizations for German-Russians; namely, the Germans from Russia Heritage Society (GHRS) headquartered in Bismark, ND. Like the AHSGR, the GHRS has a great library of genealogical information and can provide research services. As well, there are local chapters of the AHGRS and the GHRS in many cities around the US and Canada. Check here for AHSGR chapters near you. Through local chapters, you may be able to get access to materials through inter-chapter loans. As well, there are specific efforts to manage information on a village-by-village basis; for example, here is Rastadt, home to my Wilhelm ancestors, as you can see by scrolling down to the names of the villagers towards the end of the page. It would never have occurred to me, out of the box, to use WebMii in this fashion; but some interesting results. 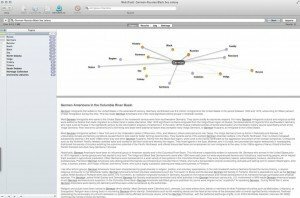 Likewise, among the most complete resources on the web for anyone with a background from the Beresan is the Roll Family site. This is not the easiest site to look at, but it contains a significant amount of information not just on the Roll family itself, but more generally on most of the families in the villages near those that the Roll’s lived in. 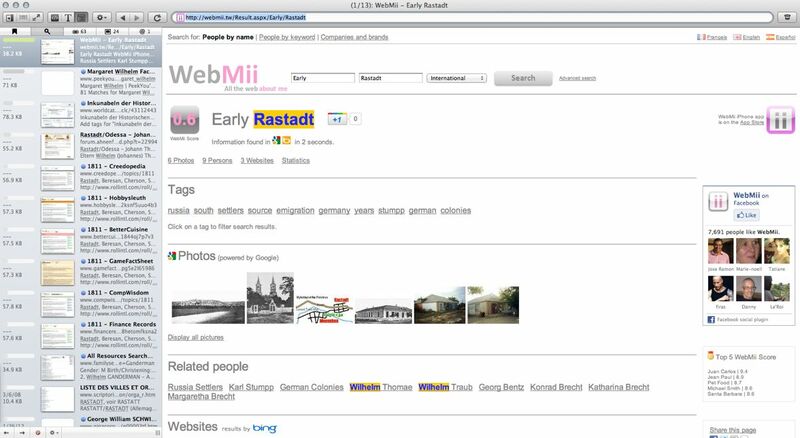 For example, their page on Rastadt includes some information on my Wilhelm ancestors. Yours may be referred to here as well. All of this, and more, can be found with DEVONagent. In terms of organizing the information that you find, and maintaining it in an accessible and searchable form, DEVON also provides DEVONthink. This is another valuable tool for archiving everything from web sites, in case they disappear later, to images, to databases of your GEDCOM files and anything else you might accumulate during your researches. Of course, DEVONthink isn’t limited to genealogy, or even targeted at this area; but it works extremely well for keeping track of this kind of material. Another excellent online resource is at Odessa, a database of genealogical information specific to German-Russian family research. Here, I found information on obituaries and grave locations for many of my relatives who had emigrated from Russia into Canada and the US. It is a great resource. Specific to Canada is their genealogical and family search facility. This site also allows you to drill into specific provincial archives. As in the US, German-Russian settlers largely came to the mid-west and west; for example, the Dakotas, Nebraska, and Kansas in the US, and Manitoba, Saskatchewan and Alberta in Canada. Especially for folks searching for ancestors in the US, Family Search may also prove of value. Like Ancestry.com, the predominant records are from the US, which is good for when that works for you, not so good if you’re trying to search outside the US. By the way, one of the best books on the Catholic colonies north of Odessa is by Joseph S. Height, Paradise on the Steppe, subtitled A Cultural History of the Kutschurgan, Beresan, and Liebental Colonists, 1804-1972, published by the North Dakota Historical Society of Germans from Russia, Bismark ND, ISBN 0-9742620-3-X. I got my copy from the AHSGR book store. If your ancestors settled in, or even passed through the Dakotas, then there is also George Rath’s The Black Sea Germans in the Dakotas, Pine Hill Press, Freeman SD. Again, my copy comes from the AHSGR. Well, that’s about it for now. Of course, I’ve probably missed something. If you have favorites that are below my radar, let me know in a comment. This was a great article, especially for newbies researching for their German Russian Ancestors. 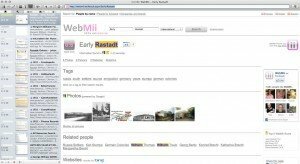 It took me many years of researching to find all these sites and here they are all in one artilce. Great Job! It took me that same long time as well, and I continue to discover new resources. For example, I lately came across Ancestors from Russia, a site by Valery Mock. I get the impression that Mock lives in Odessa still, although I might be wrong about that. In any case, he’s translate many formerly secret reports from the Soviet administration of the region back in the 1920s, including lists of executed prisoners, transported prisoners, and so on. It is chilling to find one’s family names in those lists, in my case, Kellers and Millers. Reading those lists reminded me of the movie, The Red and The White, by Miklós Jancsó. When I saw that movie back in 1968, I had no clue that any of my relations had been caught up in that. I am new to Ancestory.com and have run into all the mis-information you noted. Your Grandfather is my Uncle Martin whom I only met once when I was about 12. My father is the youngest Scherger sibling (Harry). Uncle Martin just knocked on our door out of the blue and my dad was not happy to see him. After Barbara (Heck) Scherger died there was a strain on the relationship between your Grandfather and his Step-father (John Scherger) and I think it was at that point your Grandfather left. When John Scherger died my dad and Aunt Amelia were very young and did not have it easy. Apparently my dad held on to some resentment – feeling that if Uncle Martin had stayed he could have taken over the farm and my father’s life would have been better – he was about 7. I believe that they went on to build a relationship.